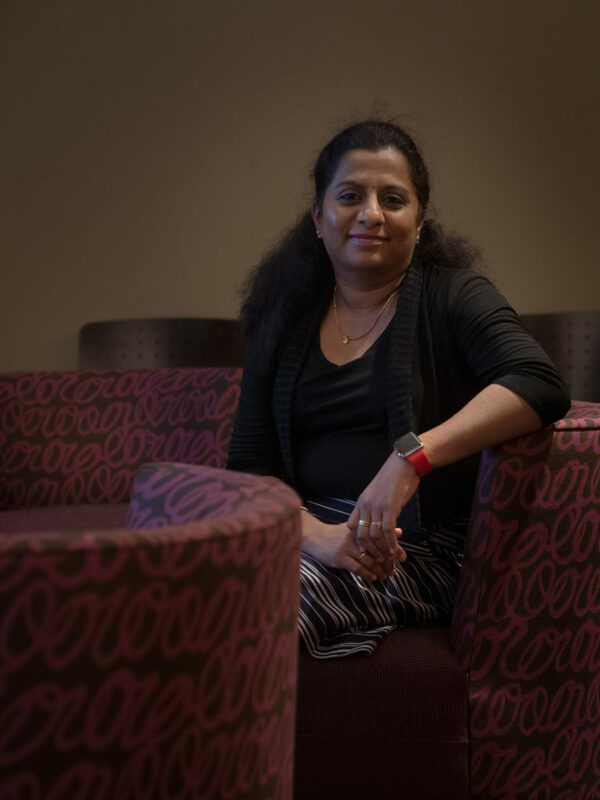 Usha sits in a lounge area of the cafeteria space on UFG’s downtown Cedar Rapids campus. Meet Usha. She’s been with UFG Insurance for two years as an Application Development Team Lead. She values her position at UFG because UFG values her. UFG allows Usha to balance work, life, being a parent, and professional development. Usha is a lifelong learner and loves the fact that UFG invests a lot in employee training, from conferences to in-house trainings to lunch and learns. She said that UFG’s flexible work environment is great for being a parent because doesn’t have to be in the office do her job. The option to work from home cuts down on commute time and helps her get her kids to a lot of after school activities. Here’s a snapshot of a day at UFG with Usha. 5:00 a.m.: Wake up, exercise, read. 6:00 a.m.: Get ready for work and get the kids ready for school. 7:30 a.m.: Drop the kids off at school. 9:00 a.m.: Arrive at work. Get a feel for the day by checking email and Slack. Everyday, Usha’s team gets together for 30 minutes to go over what they accomplished the prior day, any impediments they’re facing, and what they’re working on today. Depending on the day, her standup is a meeting of people in-person or on Skype. Usha is a team lead for two groups, so she has two standups. Because Usha is a team lead, her time is split between writing code, reviewing code, and managing projects and developers. In the morning after standups, she’s usually working on removing impediments for her teams, researching and resolving issues, and pair programming with team members. Usually Usha brings her own lunch to work and then goes for a walk downtown, but sometimes she has a working lunch if her project load is heavier. At least once a month, she and her team celebrate their progress over the last month together at lunch at a local downtown restaurant. Her personal favorite lunch place is Blue Strawberry (she recommends the chicken tortilla soup!). Usha usually spends her time reviewing and writing code. She tends to have less meetings and more 1-on-1s with developers or pair programming. 5:00 p.m.: Time to go home. After work Usha helps get her kids to after school activities. When she has time, she enjoys spending time doing her hobbies like dancing, crafting, and playing tennis.